This is intense. Scientists have completed a 3-D image of an entire human brain in breathtaking detail using over 7,400 micro-slices of tissue. I wonder how long it took for them to reassemble all of those slices? That waxy-brain-feeding-tray machine is a bit creepy. Scientists have imaged the anatomy of an entire human brain at unprecedented resolution. More detailed models of the human brain will help researchers explore both normal function and disease. 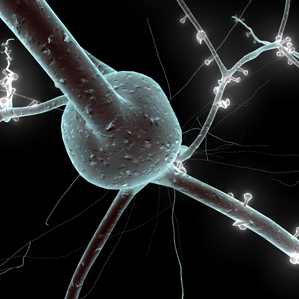 Making connections:The protuberances on this 3-D model of a neuron are “pre-synaptic terminals” –points where the cell will form connections with other neurons. A new resource will allow scientists to explore the anatomy of a single brain in three dimensions at far greater detail than before, a possibility its creators hope will guide the quest to map brain activity in humans. The resource, dubbed the BigBrain, was created as part of the European Human Brain Project and is freely available online for scientists to use. The researchers behind the BigBrain, led by Katrin Amunts at the Research Centre Jülich and the Heinrich Heine University Düsseldorf in Germany, imaged the brain of a healthy deceased 65-year-old woman using MRI and then embedded the brain in paraffin wax and cut it into 7,400 slices, each just 20 micrometers thick. Each slice was mounted on a slide and digitally imaged using a flatbed scanner. Alan Evans, a professor at the Montreal Neurological Institute at McGill University in Montreal, Canada, and senior author of a paper that reports the results in the journal Science, says his team then took on “the technical challenge of trying to stitch together 7,500 sheets of Saran wrap” into a three-dimensional object using digital image processing. Many slices had small rips, tears, and distortions, so the team manually edited the images to fix major signs of damage and then used an automated program for minor fixes. Guided by previously taken MRI images and relationships between neighboring sections, they then aligned the sections to create a continuous 3-D object representing about a terabyte of data. 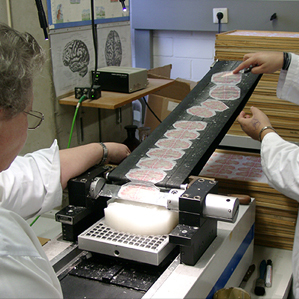 Sliced up: Researchers used a tool called a microtome to cut a brain into slices 20 micrometers thick. Evans says that existing three-dimensional atlases of human brain anatomy are usually limited by the resolution of MRI images—about a millimeter. The BigBrain atlas, in contrast, makes it possible to zoom in to about 20 micrometers in each dimension. That’s not enough to analyze individual brain cells, but it makes it possible to distinguish how layers of cells are organized in the brain. Joshua Sanes, a neuroscientist at Harvard University, says the project represents one step toward realizing neuroscientists’ aspiration of looking at the human brain “with the sort of cellular resolution [with which] we can look at mouse or fly brains.” But while the atlas is a technical achievement that gives an unprecedented view of an entire brain’s anatomy, it can’t answer questions about brain activity or function, or about the connections between brain cells. The atlas also represents only a single brain, so it doesn’t capture variability between brains. But Evans says it can be an important resource for future research. One of the larger goals of several brain initiatives worldwide—including the European project and the nascent BRAIN Initiative in the U.S. (see “The Brain Activity Map”)—is to integrate different kinds of data about brain structure and function, he says, and to create computational models of the brain to study processes such as childhood development or neurological diseases. Evans says such work depends on having a clear picture of the brain’s anatomy as a reference, and the BigBrain can serve as a platform on which other information can be mapped. “It’s the mother ship,” he says. The researchers plan to lead studies integrating the BigBrain with other kinds of data, examining questions such as how genes are expressed and how neurotransmitters are distributed across the brain. They hope to repeat this work in other brains to start to look at how their structures vary.